Honest to Goodness Hometown Service! 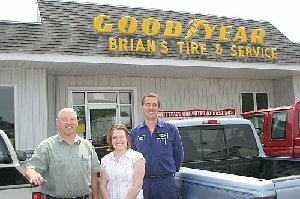 Brian's Tire and Service, your Goodyear Tire Center in Hastings, brings to the motoring public one of the finest automotive service centers in West Michigan! Here you will find only the finest professional service, with qualified, trained service personnel. Whether your vehicle needs and engine tuneup, brake replacement, a new set of Goodyear tires, or an oil change, you can depend on Brian's Tire and Service! Brian's Tire and Service... the place to go for honest to goodness hometown service!